Click Add Account in the left sidebar and set it up as a Linked account. 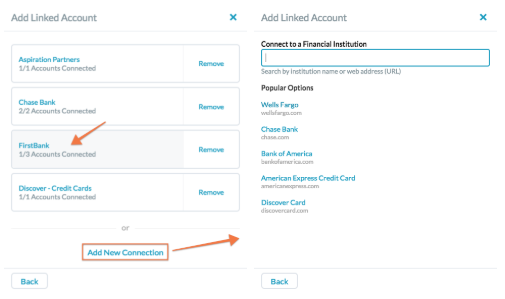 Choose one of your existing connections -or- Add New Connection to search for your financial institution by name or URL. If this is your first connection, you'll skip right to the search. Select the account you'd like to add. Then, give the account a nickname and click Next. If you search for your financial institution and come up empty, you can suggest an institution. 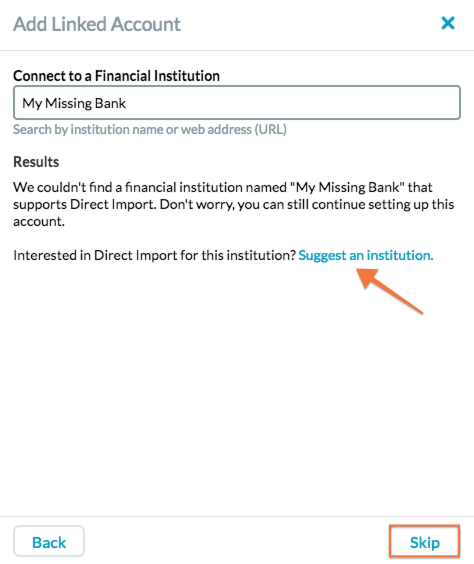 We can't guarantee if or when a new institution may be added, but your request will help our Direct Import provider prioritize which banks to add next. 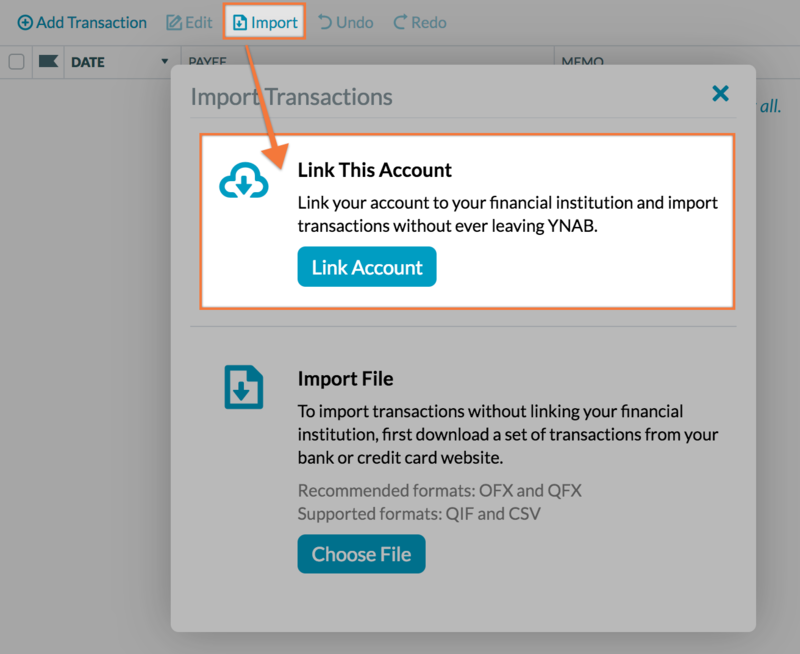 In the meantime, you'll be able to import transactions from a file downloaded from your bank as a quick and easy alternative to Direct Import! 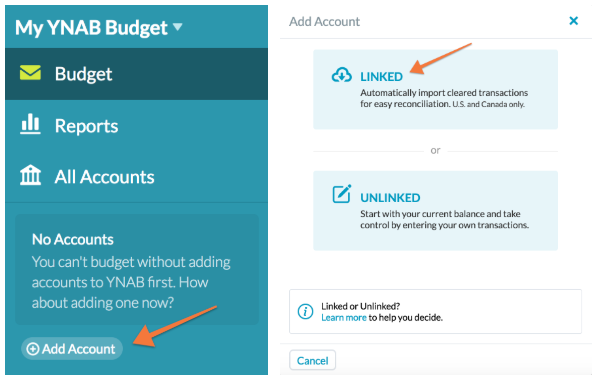 Once you have linked an account, YNAB will import your most recent balance—and that's it. Transactions that cleared before the date of the starting balance will not be imported. As your pending transactions clear, they'll be available to import within 24 hours. If you have any transactions to import, approve, or categorize, you'll see a notification dot next the the account name. When you select the account, you'll see a banner across the top. Clicking the banner will import new transactions and apply a search to show you just those transactions and any others that need to be categorized or approved! Reconcile your account. This helps limit the possibility of duplicate transactions. Click on the Import button at the top of your account register and select Link Account. If this is your first connection, search for your bank and follow the prompts. Otherwise, select from your list of connections or choose Add New Connection and search for your financial institution. Enter your login credentials and follow the prompts. If you run into an error, try these troubleshooting steps. Select the account you'd like to link to your account in YNAB! Once the account is linked, if you have any recently posted transactions, you'll see they're available to import. YNAB will import transactions that cleared up to three days prior to your latest reconciled transaction. If you happen to see any duplicates, you can reject them—and you shouldn't see any others going forward. And you might want to reconcile again for good measure. Check out our troubleshooting article, but whatever you do—don't let it stop you from budgeting! Enter your transactions (in the mobile app when you're on-the-go) or better yet, try File-Based Import. It's as simple as dragging and dropping a file into YNAB.